The wonder that is social media, all bless Twitter, has attracted my attention to a little haven for illustrative Artists, to post their new works and get some feedback. 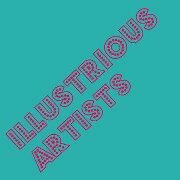 Illustrious Artists is a Facebook group or rather Facebook community squishing together the plethora of talent the Facebook savvy illustrators have to offer. With a non judgemental air the group respond to all artists akin whether it's digital, oil, sketches or romantic squiggles, they all settle under the title of art in this domestic gallery. For me, as an up and coming cottage industry of creations, sketches and ricocheting ideas, a place to call home from home is important, a stop gap from just telling my friends what I have produced this week and a chance to stand side by side with the other crazies that we call artists. "Having searched high and low on Facebook, I have found there are lots of groups where people share their art, but none with a slant towards illustration, or modern contemporary, youthful, more cutting edge (!) (even though I am not particularly young or cutting edge myself haha) graphic/ digital art, including photography. As a self taught illustrator who also considers herself to be an artist, interested in photography and this type of art, I thought, well why not create one"
Since joining just a few days ago I've been back many times, looking at the subject of the fellow artists, admiring (from a distance) the choice of colour, tone or general feel of many excellent works - it's quite addictive and with the posting of new works happening practically every twenty minutes there is always plenty to excite and inspire. So Well Done all those involved in the thought process of bringing the art world such a space and I'll be back, time and time again.